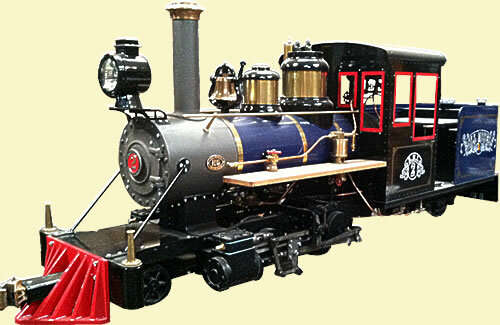 Roll Models Inc.: Miniature Live Steam Locomotives for your club, backyard, shopping mall or park. RMI Railworks currently offers two 6-coupled, two 4-coupled, and two Forney style complete locomotives. All are 3.75" scale narrow gauge for 7.25", 7.5" and 12" tracks. There is a high degree of commonality among all models. They all share the same castings, and most water-jet and laser-cut parts. This assures interchangeability and helps us control manufacturing costs. 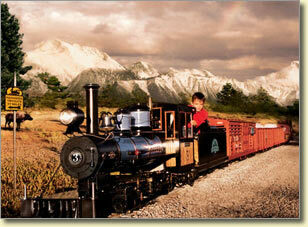 Our steam locomotives are available in real live steam version which may be built to fire using coal, oil, or propane. For indoor use such as shopping malls we offer an electric steam outline version with a powered tender to push the locomotive around the track while giving the illusion of a real steam locomotive. For the builder, parts are available in a number of levels of finish. Castings can be purchased raw or fully machined. They are made from the best grade ductile or gray iron, aluminum, steel and bronze. Frames are flame cut from 1" thick steel plate, normalized and straightened. They are also available fully machined. Other steel parts are laser cut and CNC machined. Rods and motion are cut, not cast, from thick section 6061-T6 aluminum (3/4" and greater) plate using ultra-high pressure water-jet equipment. Sub-assemblies such as the Johnson-bar, fire box door, smoke box saddle, etc. are available as separate kits. Special parts such as piston rings, valves, and gaskets are stocked. RMI also offers finished boilers. There are presently two models, a shorter version for 4-coupled locos, and a longer one for 6-coupled locos. Both are Water Leg Boilers (wet firebox wall) style. Both have thirty-two 3/4" flues. We hope the following models will meet your needs, either with one of our current offerings, or as a starting point for your own masterpiece.